International Silver New York, NY hours of operation, address, phone, and more. 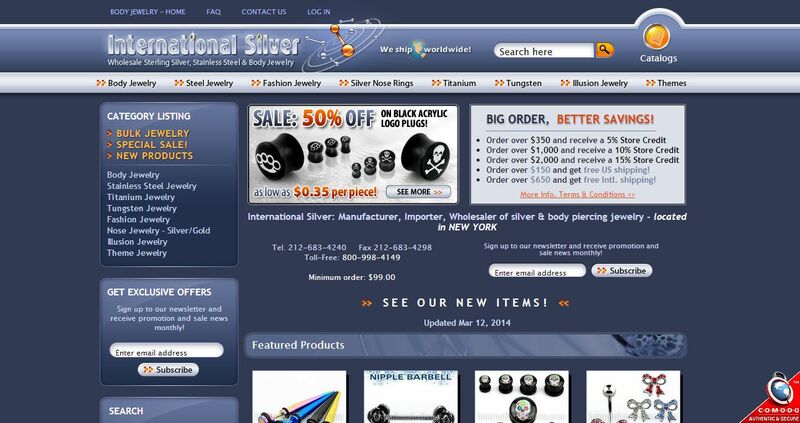 International Silver is located in New York City and has become one of the most well respected manufacturers, importers, and distributors of wholesale body jewelry in the world. If you are looking for wholesale silver jewelry, stainless steel jewelry, sterling silver jewelry, or even tungsten or titanium you will not need to look any further than International Silver. We can be your one stop sterling silver jewelry wholesale distributor as we provide quality products at the best prices. In fact, as a company our goal is to provide you with the very best silver body piercing jewelry in stainless steel, sterling silver, titanium, and tungsten that you can afford. Our staff will happily work with you to establish the products that you need and we always offer them for the price that is right.